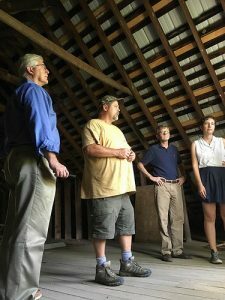 This post was originally published by Megan McConville, Senior Policy Advisor to the Rural Housing Service Administrator on the USDA blog. 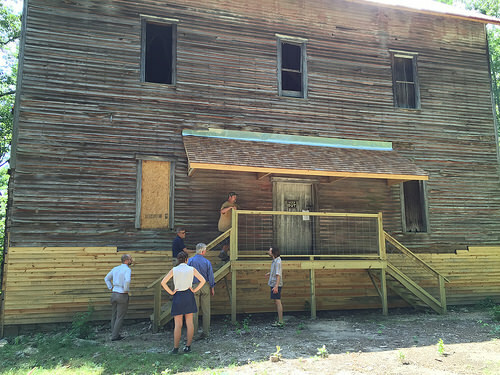 In preparation for the workshop in Alton, Missouri, the USDA and Smart Growth America team tours the historic Greer Mill, which is being revitalized as an educational facility and event space through a partnership between the U.S. Forest Service and the nonprofit Friends of Eleven Point River. How will decisions about where we locate new development or upgrade existing infrastructure impact our future economic vitality and fiscal health? How can we site and plan public facilities and housing so they have the greatest benefits for our community? How can we rebound from years of population loss? How can we capitalize on our unique history to become the kind of place we want to be in the future? These were some of Alton, Missouri’s residents’ many questions Smart Growth America addressed during a recent USDA Rural Development supported technical assistance workshop. During my visit to Alton, I was amazed at this small town’s vision, energy, and commitment to revitalizing its economy and improving the lives of its 870 residents. Local leaders are bringing life back to their downtown by improving the built environment and hosting cultural events, developing the regional food system, strengthening tourism to nearby National Forests and beautiful rivers, and more. However, I’ve seen rural communities with similar dreams fall short of their goals due to a lack of technical expertise, local capacity, financing, and partnerships. That’s why USDA is working with Smart Growth America to bring innovative solutions, funding ideas, and insights from their experiences around the nation to communities who want a brighter future. In rural communities like Alton; Rifle, Colorado; and Brookings, South Dakota, USDA is teaming up with Smart Growth America to work with local elected officials, city and county government staff, affordable housing nonprofits, economic developers, and other local stakeholders to tackle tough challenges related to development, infrastructure costs, housing, economic stagnation, population decline, and more. Through interactive workshops (like the one I attended in Missouri) and fiscal impact analysis, which estimates the budgetary costs and benefits to municipalities of development decisions within their borders, Smart Growth America has helped these small towns identify strategies to build on their distinctive sense of place in order to grow their economies, retain and attract residents, and improve quality of life. Now your rural community can apply to receive similar help. Smart Growth America has announced the availability of more free technical assistance, thanks to cooperative agreement with the federal government. Towns, cities, tribal governments, and regions across the country can now get expert analysis and ideas of creative solutions on downtown revitalization, green building, climate resilience, safe and vibrant street design, and more. Communities can apply here through October 6th. If you’re interested, find out more on the Smart Growth America website or check out this Smart Growth America webinar. In addition, through its partnership with USDA Rural Development, Smart Growth America has launched a new Rural Development program that will provide technical assistance, policy toolkits and best practices, an online funding clearinghouse, peer networking opportunities, and more to rural leaders. Visit Smart Growth America’s Rural Development webpage for updates and to get involved. To find out more about how USDA Rural Development is helping rural economies grow, visit Rural America is Back In Business. Over a homemade lunch provided by the Oregon County Food Producers and Artisans Coop, local leaders and residents from Alton, Missouri and surrounding communities strategize about opportunities for collaboration around local food systems, tourism, and downtown revitalization.